It's been nearly two decades since Jeff Hardy has been professional wrestling "enhancement talent." Now a cumulative six-time World Heavyweight champion and World Wrestling Entertainment 'Grand Slam' champion, the current Total Nonstop Action superstar still remembers those early days of his career fondly. "Even before we went to WWE, it was WWF at the time, we would watch the 'job' matches -- the 'nobodies,'" said Hardy, who first launched to fame in the late '90s tagging with older brother Matt, "That gave us the opportunity when we got in the door to really make an impression." Life-long wrestling fans, the Hardys even started an independent wrestling promotion in their home state North Carolina. There they gained experience alongside childhood friends Shannon Moore, Gregory "Shane" Helms, Joey Mercury and Steve Corino. All went on to major accomplishments in the squared circle. During a Mar. 11 telephone interview, Jeff recalled using that time to study the industry and wait for his opportunity. "I was confident even then that I was going to impress somebody when I got the chance to be that 'nobody,'" he shared, "And prove I could be 'somebody' eventually." That happened in 1998, when The Hardy Boyz signed with WWE. Over the ensuing decade, the brothers became one of the most iconic teams in wrestling history, winning multiple World tag titles amid legendary feuds with Edge and Christian as well as The Dudley Boyz. Eventually, they split to pursue solo interests. Now the brothers are more than just "somebodies" in sports entertainment. Both are globally-recognized superstars headlining TNA's IMPACT Wrestling. After being with the company a number of years, Jeff was finally joined by Matt. The pair reunited to defeat The Wolves -- Eddie Edwards and Davey Richards -- for their first TNA World tag team titles last year before Jeff broke his leg in a motocross accident, forcing the siblings to vacate the championships even before their first title defense. "It was supposed to be a really special reunion, with my brother and me getting a run with the tag belts," Matt confirmed during a separate telephone interview two months ago. "His accident obviously changed all that." "Getting hurt outside the ring was such a bad thing," admitted Jeff. "I let so many people down. I hurt TNA by doing that." Now, though, he is ready to set things right -- and exact a little revenge in the process. Returning to in-ring action for the first since his injury, a January broadcast of TNA saw Jeff again sidelined by an attack from Eric Young. "The Maniac" drove Hardy head-first through a table with a piledriver, putting him down for another two months. They face off in an epic March 15 grudge match live on IMPACT. "He's so insane and does crazy things so well. I'm pretty much the same, I just don't express myself in that manner," said Hardy of Young, who he's never faced one-on-one. "It's crazy vs. crazy; I think I'm the good side of that crazy. I'm looking forward to it." Hardy hopes Tuesday's match with the TNA King of the Mountain champion satisfies his need for revenge, because he wants to focus on other aspects of the company. He admits it will take some re-acclimating, though, because IMPACT is a very different landscape than before his injury. During his absence, TNA jumped to a new, improved broadcast night and cable home -- Tuesdays on Pop TV (formerly TV Guide Channel). Olympic Gold Medalist and multi-time TNA World champion Kurt Angle has retired. Old rival Ethan Carter, III (EC3), is now a two-time World champ. And fresh, new faces like Eli Drake and Ring of Honor veteran/TNA newcomer "The Miracle" Mike Bennett are pushing toward main event status. The most notable change, however, is in Jeff's own brother. Forced to relinquish the TNA World title in controversial fashion last fall, Matt ultimately lost to EC3 in a tournament finals to crown a new champ. Disheartened by defeat, and egged on by wife Reby Sky, the elder Hardy used nefarious means to later regain the belt. Now "Big Money" Matt, to the chagrin of fans, is enjoying his second TNA World title reign. "The 'Big Money' Matt thing is definitely an extension of who he is," said Jeff, a three time TNA World champion himself. "I think he is better than he's ever been, and I'm proud to see him as World champion." However, don't expect brotherly love to prevent the in-ring confrontation teased between the two prior to Young attacking Jeff. The younger Hardy says that still looms. "Ultimately, I'd love to tag with him again, and win the titles so we could at least defend them together once," said Jeff of his long-term ideal, "Just to make my soul feel a little better about the way I messed things up. 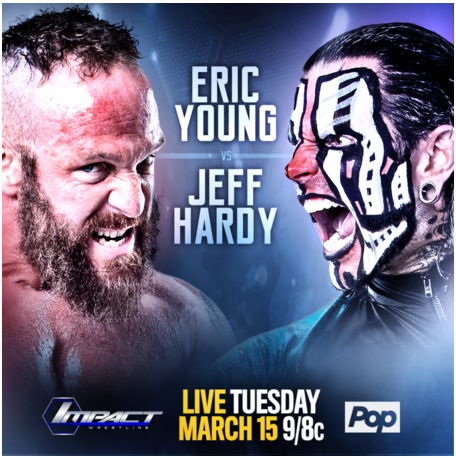 "But we've got to get that Matt vs. Jeff match out of the way first," he concluded, "And before that, I've got to get some revenge on Eric Young live this Tuesday on IMPACT on Pop TV!" IMPACT Wrestling broadcasts Tuesday nights on cable's Pop TV. Check local listings for air time and availability. 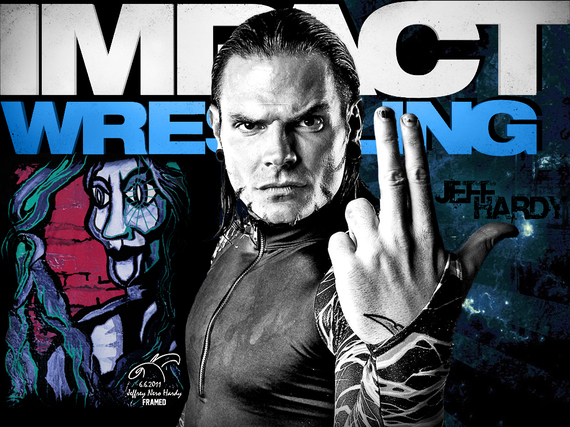 Follow Jeff Hardy on Twitter. Follow IMPACT Wrestling on Twitter.